As I pack my bags for my flight to Salt Lake City tomorrow, I thought I'd write a short post about what's in store for my readers over the next week or so. 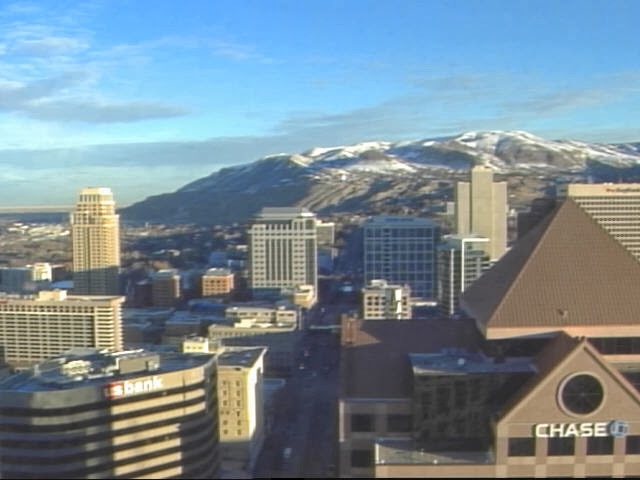 The weather currently looks bright, with blue skies, and I'm starting to get excited. As an Official Blogger I hope to be blogging regularly about some of the main events, especially the Keynote Speaker events. But for those of you not coming to RootsTech (the large majority I imagine), you can watch many of the RootsTech sessions online, from the comfort of your own armchair. You will find the list of classes being broadcast live on the Internet, on the Deseret News blog. The Keynote sessions (from 8.30 am to 10 am) will also be broadcast "live". For UK viewers, the time difference actually works slightly in our favour, as the Conference runs from 8.30 am to 6.00 pm (MST or US Mountain Standard Time) which is 7 hours back from the UK (Greenwich Mean Time). So the sessions will be running "live" in the UK from 3.30 pm through to 1.00 am - not so good if you are a morning person I suppose! However, these broadcast sessions will also be available for viewing later, hopefully shortly after the end of each session. So you won't need to stay up late into the night (unless you're a genealogy addict of course!). For my readers who are attending the Unlock the Past 4th Genealogy Cruise in Southern Australia, the time difference will make it a bit more difficult. Sydney, Melbourne and Hobart are all 11 hours ahead of the UK, and therefore 18 hours ahead of Salt Lake City (Adelaide is half an hour different to these cities - how weird is that?). Anyway, for those in Southern Australia, the RootsTech "live" sessions will be running from approximately 2.30 am to 12 pm, on the following day (i.e. from Friday 7th to Sunday 9th). This time difference will definitely suit the "early birds" better! But as I said before, these sessions will also be available to view later. For anyone who is still confused (or located elsewhere in the world), there is a handy time difference calculator here. (I've put Salt Lake City time in London here as the example). The link to "live" broadcast sessions (as well as the "catch up" recordings) should be available from a direct link from the RootsTech website, although the link isn't there yet, as I write this post (Monday). As well as the main RootsTech conference on Thursday 5th, Friday 6th and Saturday 7th February, with the three Keynote Speaker sessions, I shall also be attending the Innovator Summit on Wednesday 4th February, as well as several social events, including both the FindMyPast and the Ancestry catered lunches and Friday Night at the Library, where the Family History Library stays open late until 10 pm, especially for Conference attendees. So do watch this space for further blog posts. The only thing that might prevent me from posting regular blog posts is my health. I am currently suffering from a bit of a cough virus, and I'm really hoping that the long flight tomorrow doesn't aggravate this and knock me out completely!! So, as well as all my "techie" items (laptop, iPhone, iPad, Kindle and regular camera), I am now also packing a First Aid kit of my favourite cough / cold medicines. I know I'm not going trekking into the jungle but I do like to have my own familiar brands of cold / cough remedies with me. 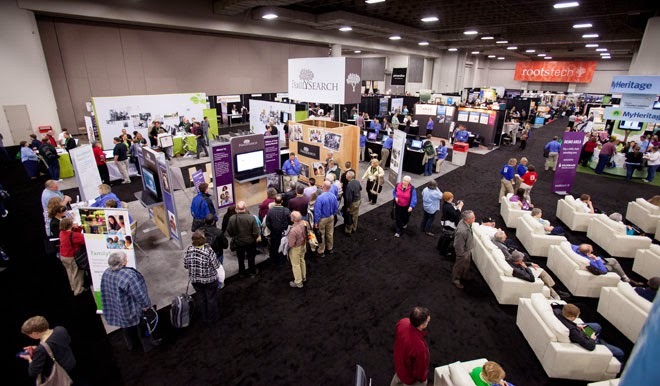 There are nowhere near as many UK genealogists venturing over to RootsTech this year, compared to last year (partly, I suspect, due to the change of date, back from late March to early February). But I do know of one or two. I have already made plans to meet up with fellow London-based family historian Amelia Bennett, and I hope to be interviewing her during the Conference for my blog. I will of course be meeting up with the other Official Bloggers, or at least those attending in person (as some will be blogging remotely). I would also love to meet up with any other Genealogists, family historians or genealogy bloggers who would like to meet me in person, whether they know me through Twitter or elsewhere. So if you're there at RootsTech and want to say "hi", do please come along to the Media Hub in the exhibition hall - you can't really miss it. This year it will be located close to the middle of the exhibition hall (see map), next to the Demo Theatre and the BackBlaze stand. Finally, I hope to be reporting on some of the exhibitors in the Exhibition Hall this year, which I didn't do much last year. So watch this space! Do come back and visit here regularly over the next week - I will do my best to update you on what I'm up to and what is going on in the RootsTech world. 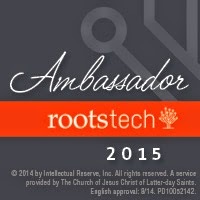 Disclosure: As an Official blogger for RootsTech 2014, I have received a complimentary registration for the conference. This does not influence my views or opinions of the conference or the sponsors in any way.